Labour has launched a campaign to persuade Croydon to vote ‘Remain’ in the EU referendum. 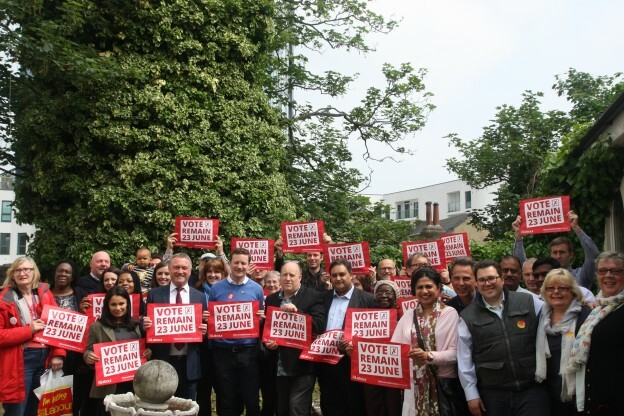 Steve Reed MP was joined on Saturday by two of London’s Labour MEPs and council leader Tony Newman to launch the campaign at a rally in St James’s Road followed by door knocking in Selhurst. Seb Dance MEP and Claude Moraes MEP both made passionate speeches about how jobs, investment and public services in Croydon depend on Britain remaining part of the EU. Steve Reed MP said: “Britain benefits massively from being a member of the European Union. One in ten British jobs is linked to trade with Europe, investment comes to our country because we’re inside the EU, and we are safer because we co-operate with our European partners on security and fighting terrorism. Mortgages and unemployment would go up if we left, and right-wing Tories are desperate to leave because they could then cut back basic employment rights secured by the EU like paid holiday, maternity pay, and rights for part-time workers.